World Ocean's Day is now officially recognized on June 8th. This day gives us a chance to appreciate and reflect about the importance of our ocean waters and impact that we have on it. It's our chance to give back in any way that we can, through outreach, education, beach clean-ups, or songs. In celebration of World Ocean Day the folks at PTMSC organized a beach clean-up. With the help of sixteen fabulous volunteers we collected trash from over a mile of Fort Worden State Park! The ocean is breathing, do you hear it? Its soft breath rolls with every wave. Making its mark upon the shore. The ocean is whispering, do you hear it? It soft voice is a melody of the wind across the water. Making its mark upon our souls. The ocean is calling, do you hear it? The sweet sound of life beneath. Making its mark upon our hearts. The ocean is weeping, do you hear it? The silent cries rise from the deep. Making its mark upon our conscience. Will you help it? Do you hear it? The voice so sweet and gentle. And keep its breath safe from harm. Ocean, we just wanted to say that we appreciate you. What do you appreciate about our oceans? In May, the Beaty Biodiversity Museum in Vancouver, B.C. 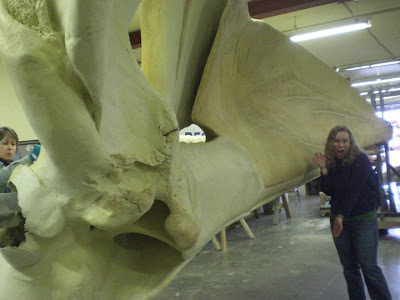 unveiled their 85 ft blue whale skeleton to the public. Some of us here at PTMSC got a sneak peak! Chrissy, Libby, Heather, and Julia with the Blue Whale skull! At the crack of dawn we rubbed our eyes, rolled out of bed, stuffed our passports in our backpacks and headed for our neighbor to the north (also known as Canada). When we arrived, this project, which had been in the works for over 2 years, was coming to an end. Lee Post, our bone expert, accompanied us. It was fascinating to listen to him swap stories and information with Mike deRoos, the head articulator for The Blue Whale Project. 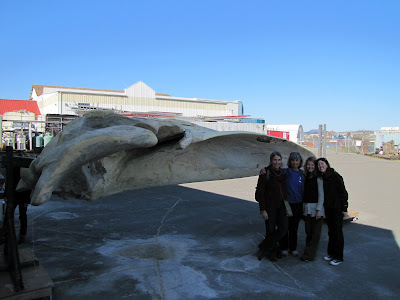 Bone Experts, Mike and Lee; examine the flipper bones of the blue whale. The University of British Columbia's blue whale skeleton is full of interesting stories; some similar and others totally different from the tales of our own orca skeleton. One of the more hilarious stories goes back to when the whale originally died on the East Coast in 1987. A local resident removed one of the blue whale's flippers (without permission!) with his personal chainsaw and stashed it in the woods behind his house for nearly 20 years. 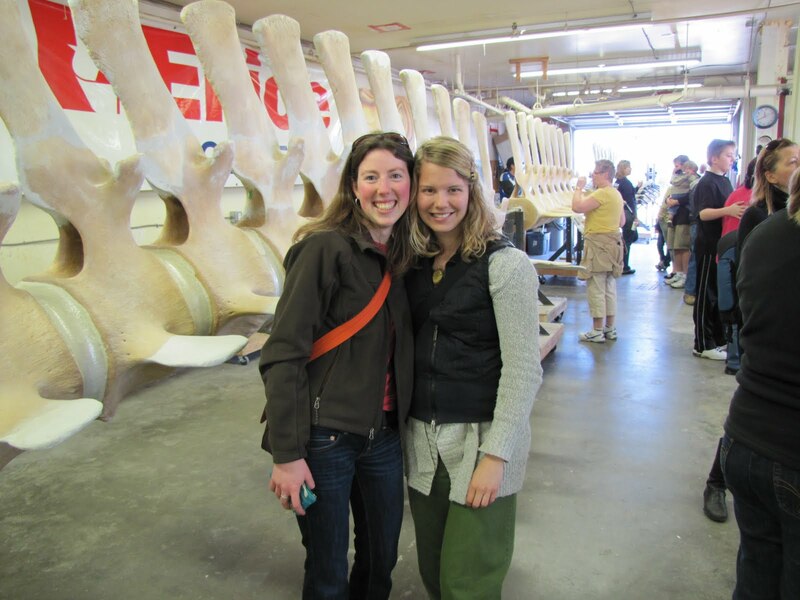 When UBC began excavating the skeleton, the man approached the crew and confessed the location of his blue whale souvenir. Grateful crew members then retrieved the bones, reuniting them with the rest of the body. This experience left me feeling like a kid in a candy shop! Giddy, excited and fully stimulated! The finished skeleton is now on display at the Beaty Biodiversity Museum. I recommend heading up there and checking it out. I'm certainly planning to! Funding for PTMSC's Orca Project comes from the Institute for Museum and Library Services.